With winter upon us, and snow starting to fall, it's time to start thinking about fun winter sports to try if you haven't already! I love exploring the outdoors in winter, and snowshoeing can be an amazing way to visit uncharted territory or even see familiar trails in a new light. Snowshoeing in the Tetons...not too shabby, eh? The first time I remember strapping on snowshoes was as part of a mountaineering class I took with Eastern Mountain Sports in the Adirondacks. The second? On a winter trip to Grand Teton National Park. Seeing an incredibly popular spot almost deserted and blanketed in snow was pretty special. 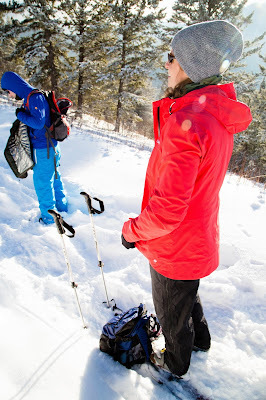 Though I’m still very much a beginner myself, I’ve learned (mostly by trial and error) a few things about how to snowshoe that can help make your first few trips more enjoyable. Generally, I've found snowshoeing more strenuous than hiking. When you’re starting out, don’t expect to cover as much ground as you would hiking; a trail that you may be able to cover in a few hours without snow may take an entire day in the winter. It helps to start on well-known, groomed trails, but be sure you’re not snowshoeing on cross country ski trails – it’s bad etiquette. If you decide to snowshoe in the backcountry, be sure you’re aware of avalanche risks in the area and, as always, make sure friends and/or family are aware of your plans. The first time I put on snowshoes in the Adirondacks, I thought, "how am I supposed to walk in these things?” You'll generally want to walk the way you would on a hike, but may find you need to widen your stride slightly to avoid tripping yourself. I speak from experience. Also, snow will give a little when you walk, as it's not solid ground, so you may not be able to walk as effortlessly as you would on a hike. If you’re in super deep snow, pretending you're marching by picking your knees up when you walk helps get your snowshoes completely out of the snow in between steps. And if you're using snowshoes with metal crampon points to help with traction, get good use out of them, especially walking uphill. Managing your body temperature on any winter outing is extremely important. If you start sweating and getting your layers wet, you're putting yourself at risk for hypothermia. I find that being a bit chilly in the parking lot is a good indication I’m dressed appropriately. On my trip to Grand Teton National Park, it was 20ºF and sunny, and I was comfortable in a base layer, shell pants, down vest, liner gloves and a hat. I brought a shell jacket and quickly realized I was going to overheat if I wore it while we were moving, but was glad to have it when we stopped for snacks. Most snowshoes have bindings that adjust to most boots, but be sure to test the fit before you go. Warm socks and insulated waterproof boots will keep your feet protected. And don't forget gaiters, they help keep snow out of your boots - I made that mistake in the Tetons and ended up with some wet socks! Even if you’re confident on your feet, having poles to help with balance makes a big difference. In the Tetons, I didn’t use my hiking poles until we’d reached our turnaround point, and on the way back, I found it much easier to get into a walking rhythm. I also wished I’d used them sooner on the few occasions where I fell into snow over my knees. If you bring poles, be sure they have snow baskets or wide baskets so they don’t sink too far into the ground. This is an especially important watch-out if you're bringing trekking poles and not ski poles. If you really want to geek out, take a peek at Snowshoe Magazine. To the expert snowshoers out there, what other tips would you add?